We're back again with another in our weekly reading list posts of books we think our community will find interesting and thought provoking. Once again, buying the book via the Amazon links in this story also helps support Techdirt. Okay, this is one of my absolute favorite books for understanding economics -- and especially the economics of information. Have you ever read a book where you keep finding yourself excited because you've discovered that other people had independently worked out a bunch of the ideas that had been sifting through your brain? That's what Knowledge and the Wealth of Nations: A Story of Economic Discovery by David Warsh was for me. It almost made me giddy, because I had just been working through my own mental model for the economics of abundance, and then I discovered that some pretty well known economists had been sorting the same things out themselves. It was exciting. The book is really well written too. Most of the first half is a fun look at historical economists (going beyond just the economics of information and growth, but using that as a sort of central theme). And then the rest focuses on the work of the economist Paul Romer, who basically brought things around in a very useful way when it comes to the economics of information. Actually, one of the things that bothered/stunned me a little was that this work had been done so recently. As I had been sorting through it, I kept thinking back to applying work from much earlier economists, without realizing that it was still considered such a challenging issue. A key point in the book is understanding how information is the key to economic growth, and in particular, the fact that information itself is abundant, rather than scarce. It's that abundance, and the ability to spread it, that creates new ideas, better efficiency, more growth and a better overall world. Before all that, many economists had actually been confused as to why some economies grew, and others didn't -- and they were equally confused about the role of technology in enabling economic growth. This book lays out a lot of points around this in a really useful manner. I reread it every few years and recommend it highly. As their name suggests, free trade agreements are designed to help trade flourish between the countries involved. The hope is that when trade increases, society as a whole benefits. One of the key metrics for assessing that outcome is to look at changes in Gross Domestic Product (GDP), which provides one index of economic activity in a country. It does not, of course, measure other things that may be important to people, such as public services or quality of life, but it's widely used. CEPR's detailed report (pdf) explains that those figures would be the uplift in 2027 if an "ambitious" agreement were reached, as compared to the economies in 2027 without TTIP. So the predicted extra 0.5% GDP growth for both the EU and US is actually cumulative growth after ten years, and represents around 0.05% extra GDP per year, in the best possible case -- hardly impressive. Another way of looking at TAFTA/TTIP is in terms of its effects on the trade flows between the EU and US. According to the CEPR study, in the most ambitious (that is, most optimistic) case, imports to the US from the EU would increase by about €187 billion in 2027, while exports from the US to the EU would increase by €159 billion in the same year. But again, looking more closely at CEPR's figures shows that 47% of those increased imports would be cars, which would also represents 41% of the increased exports. In other words, nearly a half of the increased trade that TTIP might bring according to this forecast would consist of swapping cars across the Atlantic. Agricultural output in the United States will increase in most sectors due to increased market access within the TPP region, especially in cereals (1 percent), dairy products (0.5 percent), and meat (0.4 percent). Among TPP members, the largest percentage gains in agricultural output will be in meats in Australia, dairy in New Zealand, and "other agriculture" in Singapore. Agricultural output quantities will decline in most sectors in Japan and Vietnam in 2025 relative to the baseline. As you can see, this details increases in agricultural production in 2025. But what about the increases in overall economic activity -- GDP? The largest macroeconomic impact of the TPP, in percentage terms, takes place in Vietnam, where real GDP would be 0.10 percent higher in 2025 with the implementation of the TPP than it would be under the baseline. Small gains in real GDP will also accrue to Japan (0.02 percent), and to New Zealand, Malaysia, and Mexico (all 0.01 percent). The TPP is projected to have no measurable impacts on real GDP in any other TPP member countries. The scope of the TPP negotiations goes well beyond cutting tariffs; they also cover other areas that could impact agricultural trade, including investment, trade in services, technical barriers to trade, sanitary and phytosanitary barriers, etc. This analysis does not account for the gains that might be achieved in these other areas of the negotiations. In other words, there could be more significant gains for the US and other nations in these areas. But many countries are banking on TPP giving a considerable boost to their agricultural sectors, whereas the new US study predicts no extra growth as a result, anywhere. That's important, because the governments of both Australia and New Zealand have indicated that it will be necessary to make concessions in other areas in order to obtain those hoped-for positive results for their key farming sectors. But if the prediction is that these concessions will only result in increased agricultural trade, but not increased GDP overall, the question has be asked: is it really worth accepting things like longer copyright terms and stronger pharma patents if the payback in terms of real growth is small or non-existent? Every time the major players in the copyright industries kick off another push for more legislation, enforcement or protection, they make grandiose claims about how much IP-intensive industries contribute to the economy. "Millions of jobs generating billions in revenue, a small portion of it taxable!" they shout proudly in the direction of the nearest legislator or ICE agent. If IP protection was weakened in the slightest, the nation's entire economy would likely collapse. IP is innovation, according to these industries. Weak IP laws lead to weak economies. This entertainment industry trope, filled with questionable numbers, is used to justify the endless push for draconian IP enforcement and stiff legal and civil penalties for infringement. But evidence to the contrary continues to mount, punching holes in the IP industries' favorite narrative. Yesterday, Reuters news service ran an article about a rating of eleven countries based on their enforcement of intellectual property rights. The index was prepared at the behest of the U.S. Chamber of Commerce by a group called The Global Intellectual Property Center, and it ranks the U.S. at the top of the list in terms of strong IP protection (23.73 points on a scale from 0 – 25). But what is interesting is who scored lowest (out of the eleven countries that were ranked). The four “worst” countries for providing the strong IP protection important to the Chamber of Commerce were the four countries known as BRIC — Brazil, India, Russia and China. So the four countries driving economic growth are also the four countries with the weakest IP protection regimes, amongst those 11 rated by the Chamber of Commerce report. Doesn’t the conclusion seem simple, that weaker IP enforcement is part of the picture for economic growth? Now, Smith points out that this connection is nothing more than correlation, but a few conclusions can be drawn. A lack of solid IP protection does not necessarily doom economies to subpar performance and increasing IP protection does not necessarily lead to a robust economic future. IP industries have relied on the credulity of legislators to pass off the "stronger IP enforcement results in more innovation, jobs, etc." argument, usually packaged with the "no copyright protection means no incentive to create" lie that conveniently ignores years and years of creation pre-copyright and thousands of new artists surfacing at a time when piracy is "rampant." There's tons of evidence that contradicts the rationale driving the "need" for more IP enforcement. Smith goes on to list a few examples of artists thriving with little or no protection, including "Nollywood," Nigeria's film industry, which has exploded over the last 20 years despite truly rampant infringement, and K-pop star Psy, who's looking at $8 million earned without having to rely on the protections of copyright. So, as has been suggested here time and time again, the real "enemy" of innovation and creativity ISN'T piracy, it's the industries themselves. [I]P protection is, at least a double edged sword. Piracy can reduce revenues, but it also helps to create distribution channels and grow markets. So creative industries seeking to grow in the digital economy need to do more than try, futilely, to eradicate piracy, they need to seek ways to shape their markets and their marketing to exploit the audiences that it can create. "New business model," anyone? This has been pointed out again and again. Attempting to defeat something that it at least partially beneficial is, at the very least, short-sighted. On a larger scale, battling piracy with enforcement and legislation rather than by increasing options and providing better services is more than short-sighted -- it's dangerously self-destructive. There's very little evidence that enforcement efforts are making any real dent in file sharing -- certainly nothing that would justify the time, money and effort expended. So, slippery as such conclusions can be, I feel comfortable with these two assertions. First, creative people and creative industries can thrive without strong IP protections. In fact, if you are continually looking to the government to increase IP enforcement on your behalf, your industry is probably already in bad trouble. Second, it is perfectly possible to over-enforce IP rights to the point where creativity and economic growth are stifled. There is good evidence that the US has passed that point, and the example of the BRIC nations should suggest to us that we need to reverse our course. At this point, the legacy industries are too firmly entrenched to expect any sort of nimble maneuvering or backtracking on existing IP laws. A suggestion for just such a reversal, briefly posted by the Republican Study Committee, met a swift, ignoble death at the hands of Hollywood's lobbyists, who also pressured its author, Derek Khanna, out of a job. No matter how much evidence contrary to the copyright industries' talking points is presented, the response is always the same: more enforcement, legislation and protection. It will take a severely weakened entertainment industry to give any quarter, but as long as its aims remain self-destructive, that day seems inevitable. 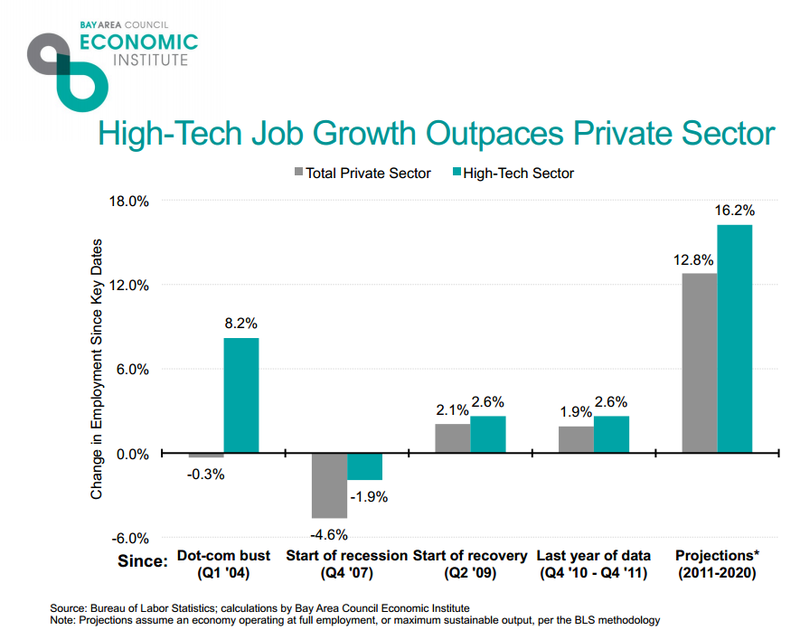 Since the dot-com bust reached bottom in early 2004, employment growth in the high-tech sector has outpaced growth in the private sector as a whole by a ratio of three-to-one. High-tech sector employment has also been more resilient in the recent recession-and-recovery period and in the last year. The unemployment rate for the high-tech sector workforce has consistently been far below the rate for the nation as a whole, and recent wage growth has been stronger. Employment growth in STEM occupations has consistently been robust throughout the last decade, outpacing job gains across all occupations by a ratio of 27 to 1 between 2002 and 2011. When combined with very low unemployment and strong wage growth, this reflects the high demand for workers in these fields. Employment projections indicate that demand for high-tech workers will be stronger than for workers outside of high-tech at least through 2020. Employment in high-tech industries is projected to grow 16.2 percent between 2011 and 2020 and employment in STEM occupations is expected to increase by 13.9 percent. Employment growth for the nation as a whole is expected to be 13.3 percent during the same period. Workers in high-tech industries and STEM occupations earn a substantial wage premium of between 17 and 27 percent relative to workers in other fields, even after adjusting for factors outside of industry or occupation that affect wages (such as educational attainment, citizenship status, age, ethnicity and geography, among others). The growing income generated by the high-tech sector and the strong employment growth that supports it are important contributors to regional economic development. This is illustrated by the local multiplier, which estimates that the creation of one job in the high-tech sector of a region is associated with the creation of 4.3 additional jobs in the local goods and services economy of the same region in the long run. That is more than three times the local multiplier for manufacturing, which at 1.4, is still quite high. These are all important points, but the biggest one may be that tech work encompasses so much these days. It's not just "Silicon Valley" at all, but all kinds of jobs for all kinds of companies. Tech isn't an industry. It's not just a job function. It's a part of nearly every aspect of our economy.. It makes other parts of the economy more efficient and increases opportunity in many different areas. And because of that, "tech" jobs are growing all over the place. 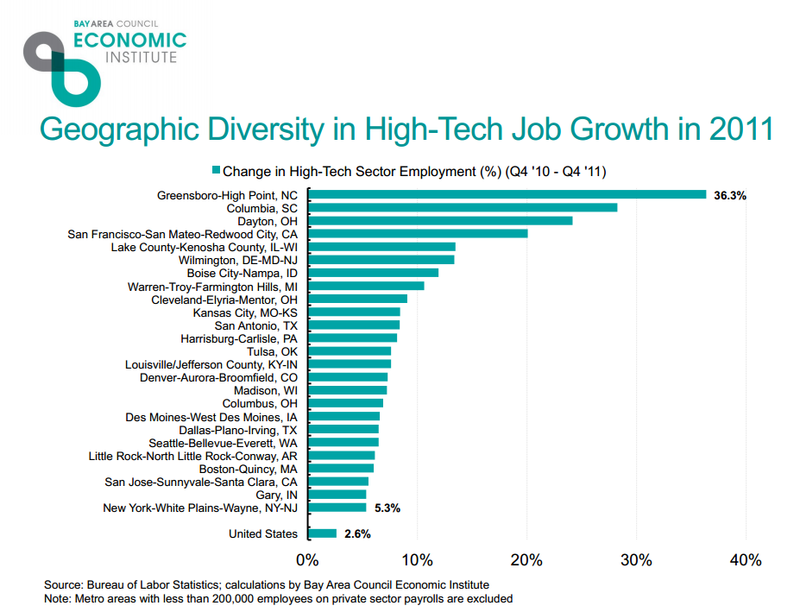 When I see that (as the report notes) places like Boise Idaho, Augusta, Georgia and Peoria Illinois are seeing the greatest amount of high tech job growth, that's a really good sign. We run into problems when all you have is a "company town" where an entire industry is based out of one place. This isn't about "the tech industry" but the fact that every single industry is a tech industry, and tech jobs are everywhere -- and, given their economic impact, incredibly important. A new presentation from the Bay Area Council Economic Institute combined with a data visualization from Engine (disclosure: I'm on the steering committee for Engine, though I had absolutely nothing to do with this project and only found out about it after it was done) looks at the nature of high tech jobs in the US today -- and it shows just how important innovation and tech jobs are to the economy. 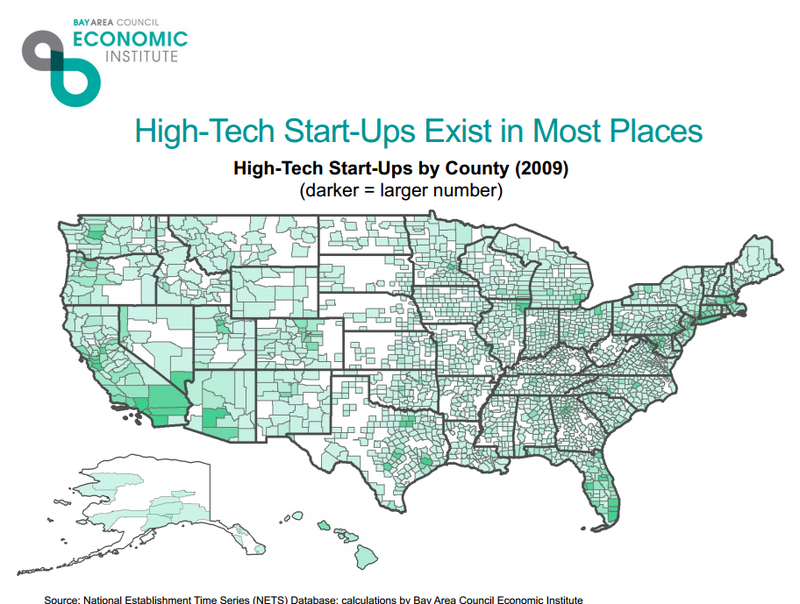 Even as we've gone through difficult economic times, high tech jobs have continually and significantly outpaced growth of the rest of the private sector: Perhaps more importantly, it shows that high tech jobs aren't just concentrated in a few key areas, like Silicon Valley, New York, Boston and Seattle -- but really are found pretty much all across the country: And, in fact, the presentation highlighted some unexpected areas of the country showing very large high tech growth in just the past few years: A lot of the places on that list above aren't areas that you'd consider to be "tech hubs." Now, of course, that last slide is just showing percentage growth, so if a place is starting from a small number, that growth percentage could be somewhat distorted. But when looking at the whole of the data, it certainly seems to suggest that high tech job growth is happening across the country -- and that's a good thing. The problem, of course, is that it often seems like the high tech industry is ignored in Congress in favor of some other industries that have a much longer history of lobbying. But if the federal government is serious about claiming that job growth is the key to our economy, then it really needs to start paying attention to these facts, and recognize that the tech industry is not just limited to Silicon Valley, and is creating jobs across the country. That shouldn't be surprising of course, since we live in a digital age, and all sorts of jobs are quickly becoming tech jobs. But it does mean that we need policies in place that allow this kind of shift to continue happening, rather than stifling it with legacy policies that just protect old and obsolete businesses who fail to adapt. If you'd like to play around with some of the data in an interactive format, the folks at Engine have set up a neat interactive map to dig into where the high tech jobs are located in the US today, even letting you look back at how it's changed over the past decade. They have been trapped in a terrible mindset that they are in the business of selling newspapers. The leap from paper to digital may be vast, but to newspaper publishers, it seemed like vaulting to a different business entirely, one they were loathe to get into. No matter what kind of lip service newspapers paid to the digital transformation, the most prominent paywall model out there, that of the New York Times, still protects print subscriptions with a tiered digital pricing strategy – one so annoying that it motivated its former digital design director to complain publicly about the entire signup process. The lesson online media companies have taken from newspapers’ slow, public death is to move beyond the idea of selling the product. Online sites are selling their audience. It’s a simple twist of the equation, but one that changes everything about how a media company is run. A CEO who has realized that her audience – her customers – is the most important thing the company has will stop at nothing to give those customers what they want. Anything to make them feel as if they’re getting value from the company. And although she’ll monetize their aggregate value with advertisers and marketers, she’ll also protect them from underhanded sales pitches or confusing pricing strategies that infuriate the web-savvy. This is a really good point on multiple levels. Beyond the innovator's dilemma (and the key point of figuring out what the real product is), Smalera is also debunking one of the popular myths of the internet era: when you're selling a user's attention, companies will naturally abuse their users. What he notes is that companies that do this don't end up lasting through the long haul, because users get annoyed and go elsewhere. Even though it's become a common pejorative statement among neo-luddites to mock the idea that the "users is the product," one thing that is true when that happens is that the companies need to treat their users right, or they have a crappy product that they can't sell. Similarly, Mathew Ingram uses this to discuss why it's so difficult for legacy businesses to adapt, noting that it's difficult to change business models on the fly. Not only do you have to make big bets on new things, but you also have to keep the legacy business running while at the same time trying to undercut it with the new thing. It's why so many companies fail the innovator's dilemma test. Unless you have incredibly visionary leadership who can push a company through with a strong and clear vision of why the company must move in that direction, the magnetic appeal of trying to prop up increasingly obsolete businesses is just too strong. But, the failure comes not because of some new "threat" or because of some kind of disgraceful activity (no matter how much legacy players try to describe it that way), but because corporate leadership chose to let others innovate, rather than supporting a plan of out-innovating themselves. Very, very few companies are willing to cannibalize their own business models -- but the failure to do that just means that someone else cannibalizes it for you. And it goes way beyond news. The chart above shows some other key areas of disruption as well. That clump of retail, automotive, construction, banking, telecommunications, pharmaceuticals and real estate represents prime feeding ground for the next decade of disruption -- much of which has already started. 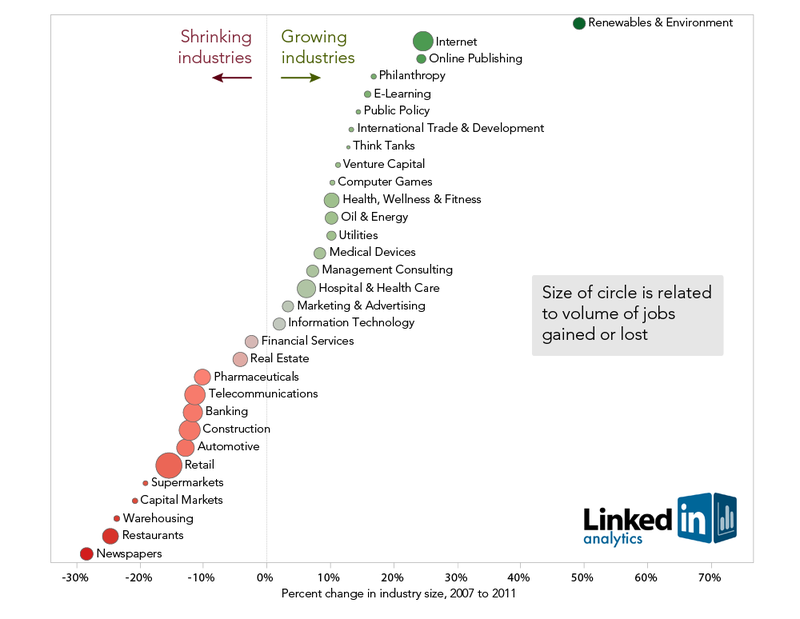 You don't necessarily see the corresponding growth points on the opposite side of the chart, but as with newspapers and online publishing, give it a few years, and those new jobs and industries will make their way up the chart, as the legacy players continue to shrivel up (and whine all the way down). Today, in Cannes, at the Midem conference, I did a presentation that was something of a follow up to the presentation I did here three years ago, about how Trent Reznor's experiments represented the future of music business models. This time, the presentation coincided with the release of a new research paper that we've spent the past few months working on, sponsored by CCIA and Engine Advocacy, in which we did a thorough look at the true state of the entertainment industry. For years, we've been hearing doom and gloom reports about how the industry is dying, how customers just want stuff for free, about analog dollars turning into digital dimes... and (all too frequently) about how new laws are needed to save these industries. Yet, what we find when looking through the research -- from a variety of sources to corroborate and back up any research we found -- is that the overall entertainment ecosystem is in a real renaissance period. The sky truly is rising, not falling: the industry is growing both in terms of revenue and content. 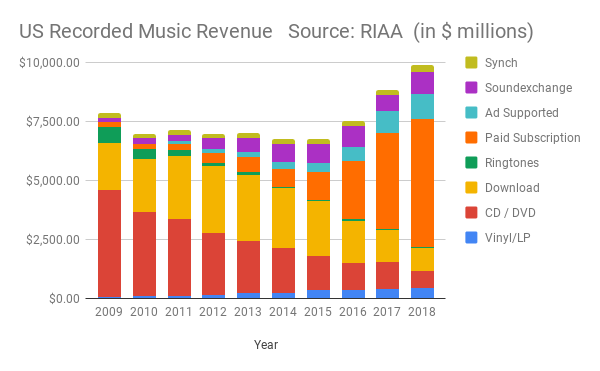 We split the report up into video & film, books, music and video games -- and all four segments are showing significant growth (not shrinking) over the last decade. All of them are showing tremendous opportunity. The amount of content that they're all producing is growing at an astounding rate (which again, is the most important thing). But revenue, too, is growing. Equally important is that rather than consumers just wanting to get stuff for free, they have continually spent a greater portion of their income on entertainment -- with the percentage increasing by 15% from 2000 to 2008. This all points to the fact that what is happening within the industry is not a challenge of a business getting smaller -- quite the opposite. It's about the challenge of an industry getting larger, but doing so in ways that route around the existing structures. Employment in the entertainment sector grew by 20% -- with indie artists seeing 43% growth. The overall entertainment industry grew 66% from 1998 to 2010. 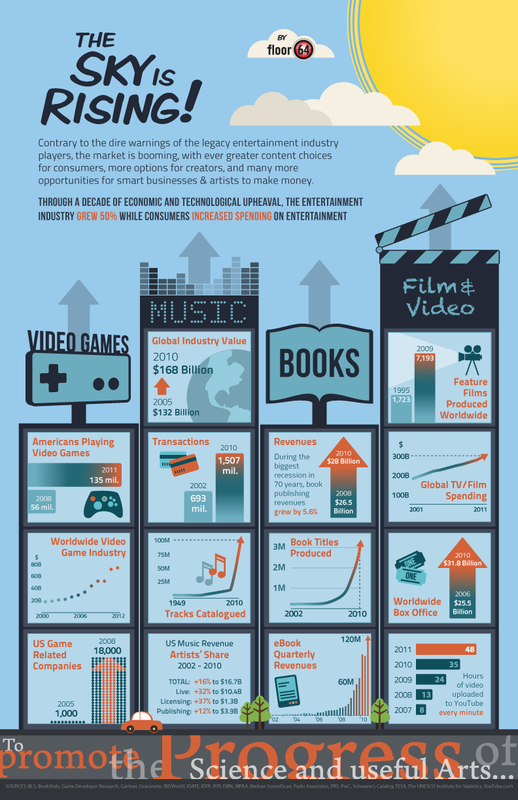 The amount of content being produced in music, movies, books and video games is growing at an incredible pace. For consumers, today is an age of absolute abundance in entertainment. More content is available in more ways than ever before. If we simply go by the terms of the US Constitution’s clause from which copyright came, it seems clear that the "progress of science and the useful arts" is being promoted -- even as copyright is often being ignored or foregone. There is just a tremendous amount of content, a tremendous variety of content, it's more accessible to more people than ever before. For content creators, it is an age of amazing new opportunity. Traditionally, to take part in the entertainment industry, you had no choice but to go through a gatekeeper, which served to keep the vast majority of people who wished to be content creators from ever making any money at all from content creation. Today, that is no longer true. More people are making more money from creating content than ever before -- with much of that coming via new tools that have allowed artists to use the internet to create, promote, distribute and monetize their works. For the traditional middlemen, the internet represents both a challenge and an opportunity. There is no doubt that the internet has eaten away at some traditional means by which these businesses made money. But, as the data shows, there is more money going into the overall market, more content being created, and many new ways to make money. That shows that there is a business model challenge -- and a marketing challenge -- but much more opportunity in the long run. The key challenge for business is in figuring out how to capture more of the greater revenue being generated by the wider entertainment industry. 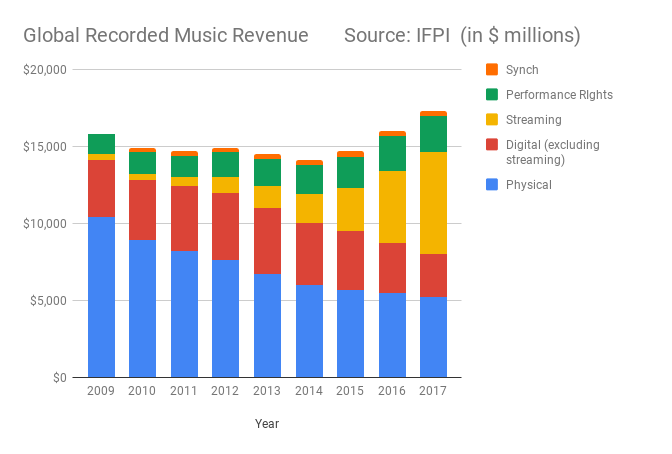 Legacy players certainly face a lot more competition (and fewer reasons that artists have to do deals with them) -- which can explain some of the public complaints about the "death" of various industries -- but overall, it's clear that by embracing new opportunities, there are plenty of ways to succeed. We're hopeful that having this kind of evidence and data will shift the debate from how to stop the sky from falling (when it's not) to one that looks at how can companies and individuals tackle the key challenge: succeeding in a much more competitive market. We hear it all the time: the entertainment industry legacy players insist that the world is ending, jobs are going away, and that they need new laws like SOPA and PIPA or it's all over. That's why SOPA & PIPA are being positioned as jobs bills. Especially popular are the major labels and the big Hollywood studios insisting that they're really doing this not to save their own companies from having to adapt, but to protect the poor, poor indie creator, who is totally being destroyed by those evil online pirates. We hear time and time again about how it's really the "indie" folks who are being decimated. Funny thing: reality says otherwise. The Bureau of Labor Statistics (BLS) has some pretty nice tools and a neat table of jobs in various industry sectors in 1998, 2008 and then projected in 2018. Let's take a look at the entertainment industry, shall we? Why yes, that does show that the industry grew nicely from 1998 to 2008... all the while we were being told it was being decimated by piracy and no one could find work any more. Oh, and check out that last line. Independent artists, writers and performers jumped from 35.2k in 1998 to 50.4k in 2008 -- the first decade of real mainstream internet infringement (Napster arrived in '99). If you're not quick with the percentages, that's a pretty astounding 43.2% growth rate. And, it appears the BLS continues to think that jobs in that sector are going to grow over the next decade as well. Damn those pesky facts. Of course, for those of us who have been following/reporting on this for pretty much all of that time, this isn't surprising at all. What we've seen is an explosion in opportunities for independent artists. Before all of this happened, it was much more difficult to be an indie artist, because the major labels and studios really were the gatekeepers. It was almost impossible to succeed without them. These days, however, it's become a choice, and there are so many ways to succeed that don't require the majors. It's no wonder that many more people are making a living as an indie artist than ever before.